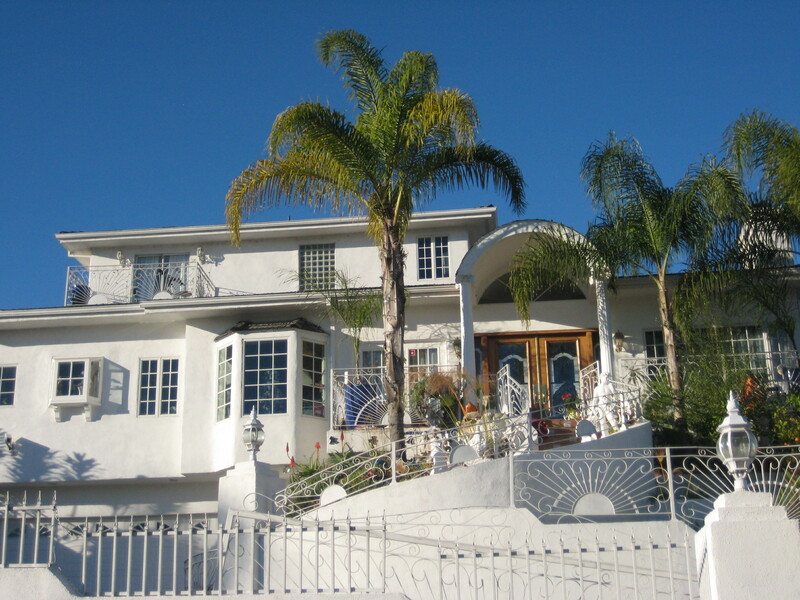 Castles | Real in L.A.
Every neighborhood should have one: an architectural horror about which neighbors can “tsk-tsk” and onto which they can project their anxiety about their own domain not measuring up. In our corner of 90039, this house qualifies. It began life as a Spanish revival stucco of modest proportions much like others nearby. More than a decade ago, the building was striped down to the floorboards in preparation for one of those make-overs that Prop 13 has engendered: leave one wall standing and you pay a higher tax rate only on the “added” square footage. A large sign proclaimed that the work was being done by Higher Power Construction. They got about as far as framing the new structure when the Higher Power plug got pulled. Bankruptcy? A divorce? Quien sabe. But there it sat for a very long time until work resumed in fits and starts by new owners. At long last, a finished house emerged in gleaming, Greek-island white, lording it over all else by virtue of its position on the highest point in the neighborhood. Throw in a few palm trees, a 3-foot version of Michelangelo’s David, a fountain, a few other gewgaws and –voila! A family’s castle. I’ve been thinking about why I find this house so annoying that I grind my teeth when I walk by–which I do quite often. Is it the SoCal sun glaring off its white walls? That silly statue? The hodgepodge of decorative elements? Lack of landscaping? The thick-walled castle effect? All of it, I suppose. The property lacks harmony and that grates on me. Does this make me an architectural snob? Why, yes, I suppose it does. You are currently reading Castles at Real in L.A..